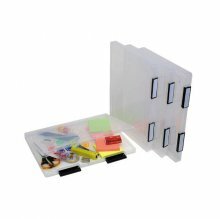 A4 Transparent case with write-on labels for easy identification of contents. Stores documents, magazines, stationery and lots more. Clips keep case closed and contents secure.